Great news! I have been told that in addition to my review (read my review here) I am to host a giveaway for a copy of Women Are Crazy, Men Are Stupid by Howard J. Morris and Jenny Lee! Tell me if you have every done anything stupid because of love (if you are willing to share, we would like to know what you have done...but this is not mandatory). 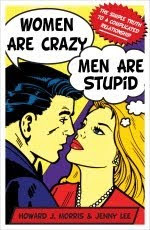 @Latsyrc728 has a #Giveaway: Women Are Crazy, Men Are Stupid http://goo.gl/fb/fUIp (02/17) #contest Please RT!! Giveaway ends 2/17/10 at 9pm EST. Giveaway is for US residents only. Winner will be chosen randomly. Winner will be contacted via e-mail and then will have 48 hours to respond before a new winner will be chosen. I am subscribing for your newsletter via email. The stupidest/craziest thing I have ever done for love was involve myself in a high speed chase! My boyfriend (now ex) had another girl in our apartment. They were leaving as I was pulling up and I followed them. I tried to get her to pull over, but she wouldn't so in my mustang, I drove 90mph on side-streets trying to run her off the road so I could talk to my boyfriend. I'm already following you via Google Friend Connect! I tried to change my way of doing things for a guy I dated in my early 20's. Didn't work. #2 I am subscribing for your newsletter via email. #3 I am subscribing for your newsletter via email. I dont know if it was stupid but it was very daring!!!! When I first met my husband, I fell in love with him instantly. I even told my co-worker at the time that I was going to marry him!!! She thought I was nuts!!!! Anyway, I worked with Ben and waited and waited and waited for him to ask me out. Finally I couldnt wait any longer. I borrowed a pen from him, wrote on a piece of paper my phone number, and then stuck the paper under the clip of the pen and gave it back to him. Finally he asked me out!!! We have been together 11 years and married almost 7!!!! !